Recording Management allows Account Owners and Admins to manage their users' cloud recordings, including view, delete, and share the video, audio, transcript, and chat files. Log in to your Zoom web portal and navigate to Recording Management. You will see a list of cloud recordings on your account. You can search the recordings using the search menu at the top. You can adjust the date range and status, then search by Host, Meeting ID, Topic, or Keyword. You can export a CSV file with recording details, including the host's email, Meeting ID, Meeting Topic, start date and time, and file size. To export this information, enter the search criteria you would like to download a report on, then click Export. Find the recording you want to view and click the topic. Pencil icon : Allows you to rename the meeting topic. Download: Downloads the recording file to your local computer. 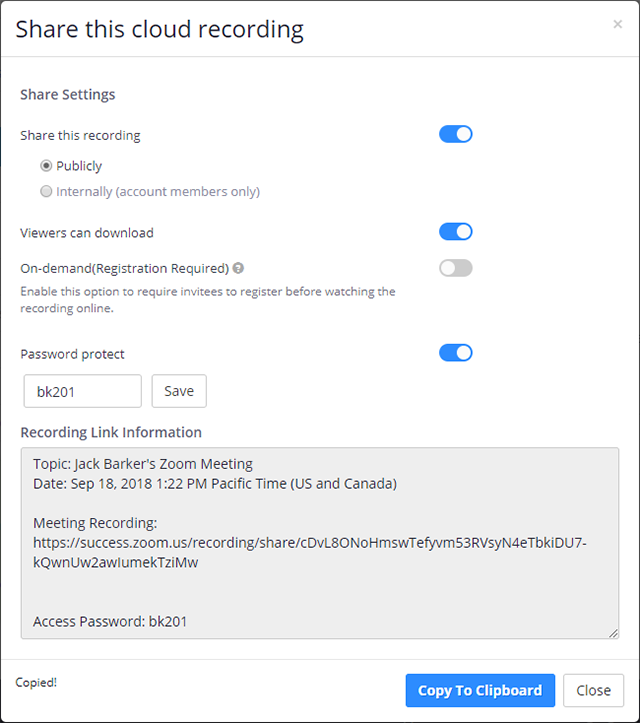 Share: Displays the recording link information and sharing settings, such as disabling downloads from viewers and requiring a password to view. Share this recording: Allows the recording to be shared publicly or internally. Switch the toggle off if you want the recording to be private. Viewers can download: Allows viewers to download the video in addition to viewing it online. On-demand(Registration Required): Requires users to enter their name and email address before viewing or downloading the recording. The host will be able to download a report with this information. Password protect: Requires users to enter a password before viewing or downloading the recording. After toggling this to on, enter a custom password and click Save. Copy shareable link: Copies the shareable link to your clipboard. Trash icon : Moves the file to your trash. 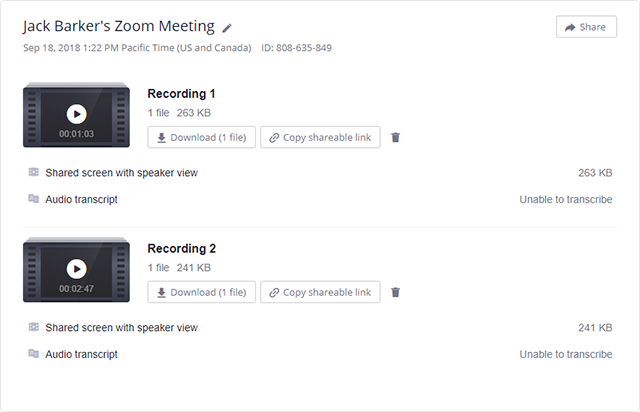 If you recorded a meeting that contained screen sharing, you'll see an additional recording file called Shared screen with speaker view, which contains the screen share portion of your recorded meeting. You can delete all cloud recordings on your account, all recordings in a specific search, all files for a meeting, or individual recording files. This will move the files to the trash and you can permanently delete them from the trash manually. If you don't permanently delete them manually, they will be deleted in 30 days. Files in the trash don't count towards your cloud recording storage. If you would like to delete all files in your account, click Delete All without entering any search criteria or changing the date range. Enter the desired date range and search criteria. You will need to confirm if you want to delete the recordings you searched for. Click Yes to confirm and move the recordings to the trash. Search for the meeting you would like to delete files from. Search for the meeting you would like to delete a file from. Click the trash icon . To view files in the trash, click Trash on the right side of the Recording Management page. Files in the trash don't count towards your cloud recording storage and will be permanently deleted in 30 days. If you do not have the Trash option, there are currently no files in your trash. Check one or more meetings and then click Recover at the top. Click Recover to the right of individual meetings to recover that meeting only. Click Empty Trash located in the top-right corner. Click Empty to confirm that you want to permanently delete all files. Check one or more meetings and then click Delete at the top. Click Delete to the right of individual meetings to delete that meeting only.